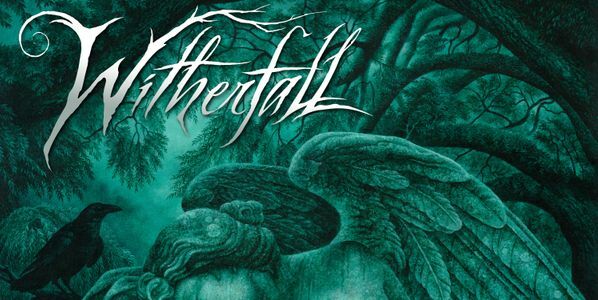 The dark, melodic, progressive metal band WITHERFALL announce the upcoming arrival of a very special, limited EP release for this spring. ‘Vintage‘ is set to be issued on CD, vinyl, and digital formats from Century Media Records on March 22nd, and will be available during WITHERFALL‘s upcoming acoustic tour with Sonata Arctica in Europe. Its contents include acoustic reworkings of two past songs from the band – a medley of ‘Vintage‘ and ‘Nobody Sleeps Here…‘, and an alternate arrangement of the song “Ode To Despair” – along with the previously Japan-only released song, “The Long Walk Home (December)“. There are also two non-acoustic songs on the EP that should be of great interest to fans of the band, cover songs recorded by WITHERFALL during the sessions for their latest album, ‘A Prelude To Sorrow‘. Intended to be bonus tracks originally, covers of Tom Petty’s “I Won’t Back Down“, with vocals by Michael Wagener (Metallica, Skid Row), and the Helloween classic “A Tale That Wasn’t Right“, are now included on this EP. For the acoustic recordings on the ‘Vintage‘ EP, WITHERFALL singer Joseph Michael (recently interviewed by Riff Relevant HERE), guitarist Jake Dreyer and bassist Anthony Crawford were joined by new keyboardist Alex Nasla and session percussionist James “Timbali” Cornwell (Smokey Robinson, Earth Wind & Fire) at Harmony Recording Studios in Hollywood, CA. What resulted from the group promises to provide a whole other dimension to the WITHERFALL sound, while retaining the band’s powerfully emotional, signature qualities established since their arrival in 2017. Mixed and mastered by Christopher “Zeuss” Harris and once again adorned with artwork from the returning Kristian Wåhlin, the ‘Vintage‘ EP will be released as a strictly limited, hand-numbered CD digipak, along with black and limited coloured vinyl, and all digital platforms. There are two options available for pre-sale of the EP, with worldwide digital and physical format pre-order via Century Media beginning January 25th, and pre-order direct from WITHERFALL active now at this LINK. The album version of the ‘Vintage‘ EP title track is streaming below, where you will also find the itinerary for WITHERFALL‘s upcoming Acoustic Adventures Tour with Sonata Arctica. Prior to it, the band will support Ensiferum and Septic Flesh at The Regent Theater in Los Angeles on January 21st.